On a scale of 1-10, where would 당신 rate Snow White's personality? Which modern 디즈니 Princess would Snow White get along with the least? Which modern 디즈니 Princess would Snow White get along with most? 당신 what snow white to be logical,funny,friendly 또는 fabulous? 또는 something else ? Why is Snow White your 가장 좋아하는 princess? This is purely based on opinion. I don't mean to offend anyone. Anyway, who do 당신 think is the best representation of Snow White in cinema? She is the fairest of them all and its no surprise. She looks fabulous with her white skin and red lips she looks a woman any man would marry. Her stepmother the 퀸 is jealous of her beauty thats how beautiful she is. No princess matches her beauty. a pop quiz question 추가되었습니다: True/False: Snow White refers to every dwarf 의해 their name in the film. 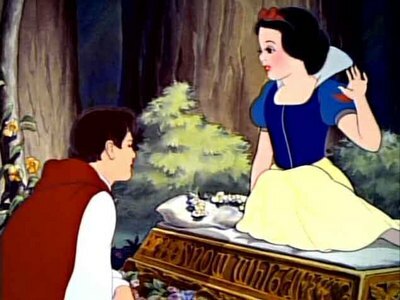 a pop quiz question 추가되었습니다: How old was Adriana Caselotti when she voiced Snow White?